^ 1.0 1.1 1.2 1.3 1.4 1.5 1.6 Bishop (2002). ^ Pompeo Magno—Incrociatore leggero. Almanacco storico navale. Marina Militare. ^ 3.0 3.1 Gardiner & Brown (2004). ^ Sadkovich, James. Reevaluating major naval combatants of World War II. Greenwood Press. 1990: 132. ISBN 0-313-26149-0. ^ McMurtrie, Francis E. Jane's Fighting Ships of World War 2. Tiger Books International. : 168. ISBN 0517679639. ^ Whitley, M. J. Cruisers of World War Two: An International Encyclopedia. Naval Inst. Pr. 1996. ISBN 978-1557501417. ^ Swords, Séan. Technical history of the beginnings of radar. History of technology series Radar, Sonar, Navigation and Avionics 6. P. Peregrinus on behalf of the Institution of Electrical Engineers. 1986: 129. ISBN 0-86341-043-X. ^ Preston, Anthony. Warship nº 5. Conway Maritime Press. 1978: 155. ^ 11.0 11.1 De Pellegrini Dai Coi, Maurizio. Scipione: posto di combattimento. Rivista Marittima (Marina Militare). January 2012: 28–40 （意大利语）. ^ Pope, Dudley. Flag 4: The Battle of Coastal Forces in the Mediterranean 1939–1945. Chatham Publishing. 1998: 121–122. ISBN 1-86176-067-1. ^ Fioravanzo, Giuseppe. Le azioni navali in Mediterraneo dal 1° aprile 1941 all'8 settembre 1943. Ufficio Storico della Marina Militare. 1970: 468–469 （意大利语）. ^ Baroni, Piero. La guerra dei radar: il suicidio dell'Italia 1935/1943. Greco & Greco. 2007: 187. ISBN 8879804316 （意大利语）. ^ Kindell, Don. 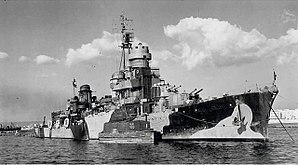 1st–31st July 1943. naval-history.net. Casualty Lists of the Royal Navy and Dominion Navies, World War 2. ^ Green, Jack; Massignani, Alessandro. The Naval War in the Mediterranean, 1940–1943. London: Chatam Publishing. 1998. ISBN 1-885119-61-5. ^ Cocchia, Aldo. La Marina italiana nella seconda guerra mondiale, volume 18. Ufficio Storico della Marina Militare. 1966: 397. ^ Bragadin, Marc'Antonio. The Italian Navy in World War II. Annapolis: United States Naval Institute. 1957: 241. ISBN 0-405-13031-7. ^ Tomlin, Barbara. With utmost spirit: Allied naval operations in the Mediterranean, 1942–1945. University Press of Kentucky. 2004: 241. ISBN 0-8131-2338-0. ^ 21.00 21.01 21.02 21.03 21.04 21.05 21.06 21.07 21.08 21.09 21.10 21.11 21.12 21.13 21.14 21.15 21.16 21.17 21.18 21.19 21.20 All the World's Fighting Ships 1922–1946, p. 297. ^ 22.0 22.1 22.2 Fraccaroli (1968)， p. 39–40. Gardiner, Robert; Brown, David K. The eclipse of the big gun: the warship 1906-1945. Conway Maritime Press. 2004. ISBN 0-85177-953-0. Bishop, Chris. The Encyclopedia of Weapons of WWII: The Comprehensive Guide to Over 1,500 Weapons Systems, Including Tanks, Small Arms, Warplanes, Artillery, Ships, and Submarines. Sterling Publishing Company, Inc. 2002. ISBN 1-58663-762-2. Chesnau, Roger (编). Conway's All the World's Fighting Ships 1922–1946. Conway Maritime Press. 1980. ISBN 0-85177-146-7. Fraccaroli, Aldo. Italian warships of World War 2. London: Ian Allan. 1968: 9–10.